The first Ghostbusters will always be one of the magnificent movie miracles. Some of the greatest comedy monsters of the time (Bill Murray, Harold Ramis, Rick Moranis and Dan Aykroyd) combined under the guidance of a hot director (Ivan Reitman, coming off Stripes and Meatballs) to merge horror, science fiction, comedy and big budget special effects. They balanced all of these elements perfectly and turned out a classic. I was not expecting anything near the brilliance or originality of the 1984 original from Paul Feig's reboot/remake/whatever-you-want-to-call-it entry into a movie franchise that has remained dormant since the miserable 1989 sequel, Ghostbusters 2. Considering the cast that Feig assembled (Kristen Wiig, Melissa McCarthy, Kate McKinnon and Leslie Jones), I did expect to have myself a good time. That didn't happen. I was bored. Super bored. I laughed a total of two and a half times at the new Ghostbusters, not once due to anything the headlining stars did. It's as if Feig (Bridesmaids, Spy, The Heat) figured, "Hey, I have these stars and a big budget for special effects. I don't really need a funny script, do I? These stars can just stand in front of a camera and be funny, right?" Perhaps they can, but not this time out. Ghostbusters is a stale facsimile of the original. If you watched those lousy preview trailers and worried that the franchise was creatively bankrupt, know that the stupid jokes in that trailer ("Ow, that's gonna leave a mark!") are about the best the film has to offer. It is utterly void of laughter. I found myself really annoyed with the haters who judged this movie by those lousy trailers before they saw the completed project. Sadly, I have now joined that camp, because I really hated this movie. The normally reliable Wiig, as the "sensible scientist," basically stands around looking lost. Comedic firecracker McCarthy, as the trailblazer scientist of the group, bumbles her way through her role with a smile but no material. My current favorite SNL star Kate McKinnon, as the brainy yet eccentric science wizard, is allowed to mug like a crack addict on an NYC subway full of inebriated, unarmed billionaires. Leslie Jones, as the street-smart member with no science chops, seems to equate volume with humor. She's just loud. After a promising start featuring Zach Woods (Silicon Valley), Ed Begley Jr. and a haunted house, the plot switches to a geek (Neil Casey) looking to cause a ghost apocalypse in Manhattan. He's planting traps around the city that attract paranormal activity, perhaps because he's lonely. 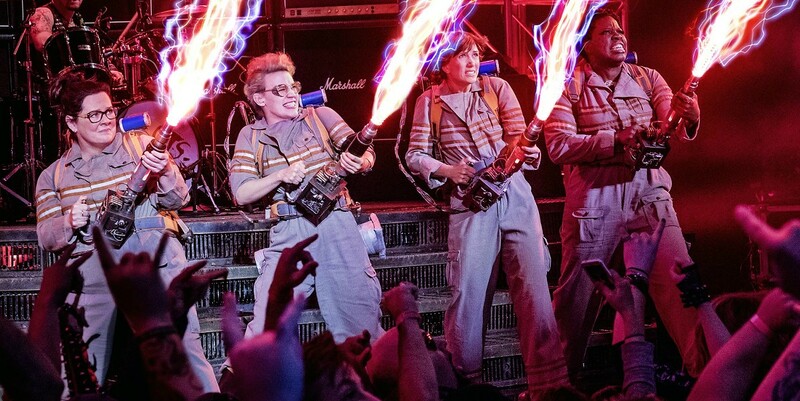 The new Ghostbusters band together to conquer the geek and save the city. The ghosts are dull, fluorescent things bolstered slightly by some decent 3D effects if you should choose the more expensive viewing route. In one of the only real compliments I can bestow upon the film, the folks putting together some of the 3D action did a pretty good job. There are moments where stuff seems to be coming out of the movie frame and suspending in the air in front of you. Those moments won't make you laugh, but they might wake you up a little. Andy Garcia as the NYC mayor made me laugh...once. Begley Jr. as a paranormal enthusiast made me laugh...once. Chris Hemsworth as a brain-dead receptionist almost made me laugh once, but it was more like a chortle. That's it. Aykroyd, Murray, Ernie Hudson, Annie Potts and Sigourney Weaver all make useless, remarkably lame cameos. Ramis makes an appearance as well in one of the movie's few inspired moments. To say this is a disappointment would be an understatement. So far, this summer has blown it with Spielberg, Superman, Batman, Independence Day aliens and now the Ghostbusters. Will Suicide Squad return some dignity to DC? Will Star Trek Beyond give the summer the big budget fun boost it needs? It's probably too late, and more than likely 2016 can't be redeemed at the cinemas. Let's hope the movies get a lot better when it gets cold outside. Let's also hope that the people steering this franchise have a laugh-a-lot script in their hands before any further adventures involving proton packs.